Saturn's moon Enceladus looks tranquil here, concealing the true nature of this active moon. To learn about the icy plumes jetting from Enceladus' south polar region, see PIA10502 and PIA08386. 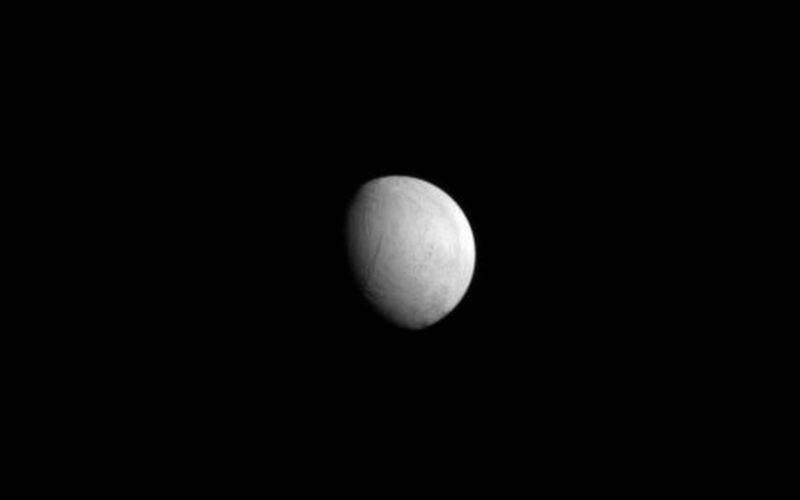 Lit terrain seen here is on the anti-Saturn side of Enceladus (504 kilometers, or 313 miles across). North on Enceladus is up. The image was taken in visible light with the Cassini spacecraft narrow-angle camera on May 10, 2009. The view was obtained at a distance of approximately 766,000 kilometers (476,000 miles) from Enceladus and at a Sun-Enceladus-spacecraft, or phase, angle of 50 degrees. Image scale is 5 kilometers (3 miles) per pixel.